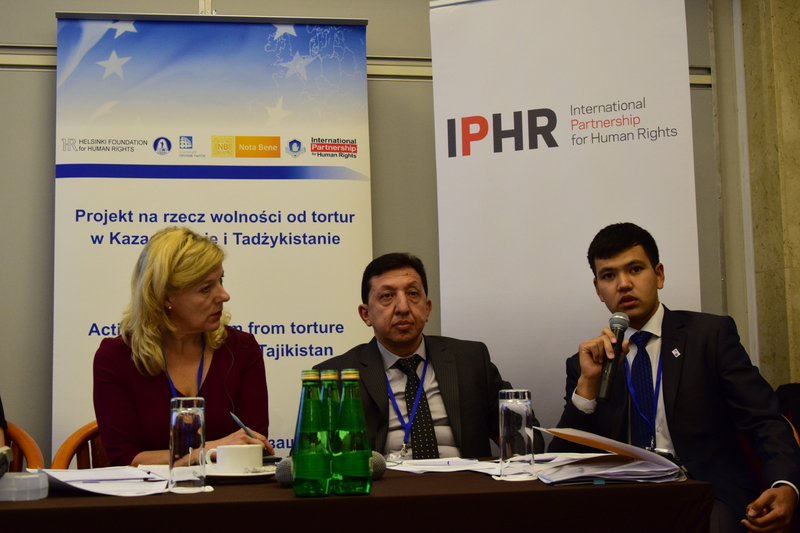 On 23 September 2016, a briefing to discuss the prevention of torture in Kazakhstan, Kyrgyzstan and Tajikistan was organized at the OSCE Human Dimension Implementation Meeting in Warsaw. 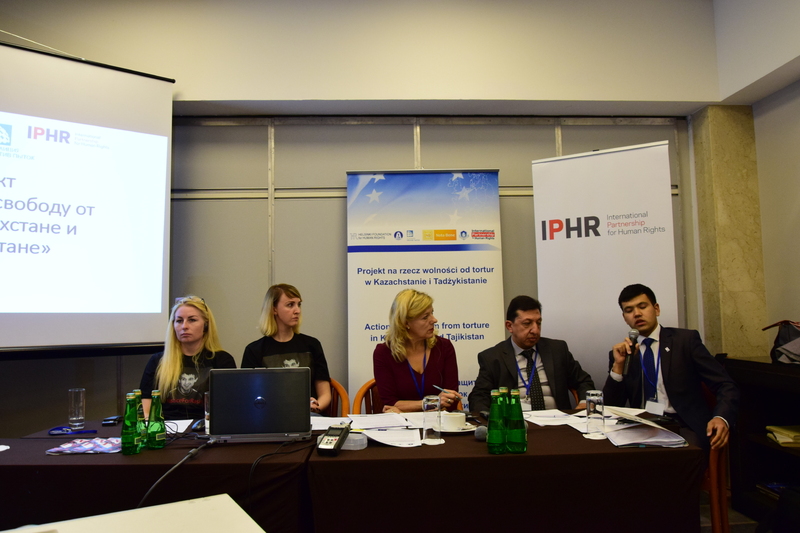 The briefing was held within the framework of the project “Action for Freedom from Torture in Kazakhstan and Tajikistan“, which is implemented by the Helsinki Foundation for Human Rights (HFHR), International Partnership for Human Rights (IPHR) and the NGO coalitions against torture in Kazakhstan and Tajikistan with financial assistance from the European Union. The event was moderated by IPHR Director Brigitte Dufour and the speakers included: Director of the Human Rights Centre in Tajikistan Nurmahmad Khalilov, Director of the Kostanai branch of Kazakhstan International Bureau for Human Rights (KIBHR) Anastasia Miller, KIBHR lawyer Anna Smirnova and Nurislam Rahimjanov from the NGO Spravedlivost in Kyrgyzstan. Independent investigations: In Tajikistan procedures of effective independent investigations into torture allegations need improving. At the initiative of the Prosecutor General’s office initiatives for regular dialogue with civil society, including on issues of torture pretention and effective investigations are planned. 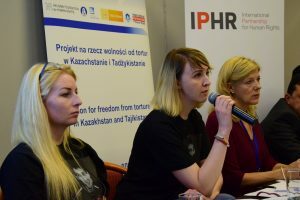 In Kazakhstan a new draft law on the prevention of torture will be presented by the General Prosecutor’s office in December of this year. Although the authorities announced last year that all allegations of torture would be investigated by Special prosecutors departments, in practice, and as stipulated in the new Criminal Procedural Code, most cases are still investigated by the police or anti-corruption police. In Kyrgyzstan the General Prosecutor’s office has a poor record of bringing perpetrators to justice. National Preventative Mechanism (NPM): In Tajikistan there is no NPM. However there is a Monitoring Group under the Human Rights Ombudsman’s office which includes representatives of the Coalition against Torture. The monitoring group carries out monitoring of closed institutions including unannounced visits. The Coalition against Torture aims to continue unannounced monitoring visits of relevant institutions. In Kyrgyzstan legislation permits visits of detention facilities, but for the last two years some monitoring visits were obstructed by the law enforcement officials. Although criminal cases have been opened into these incidents of obstruction, no guilty verdicts have been passed down by courts. In Kazakhstan NPM members are required to ask for official permission for special visits to detention facilities when there have been reports or allegations of torture and the response from the Ombudsman’s office sometimes takes too long. Impunity: In Tajikistan, the Criminal Code does not exclude those convicted of crimes of torture and other ill-treatment from amnesties, although the recent Law announcing the August 2016 amnesty for the first time excluded those charged with “torture” under Article 143-1 of the Criminal Code. The Criminal Code needs amending in this respect. Amnesties are also applied to perpetrators of torture and other ill-treatment in Kyrgyzstan, although in Kyrgyzstan only one guilty verdict for torture has been passed down. In Kazakhstan only the torture article is excluded from amnesties, but not the other articles that are often used to punish other ill-treatment. Compensation and redress: In Tajikistan compensation has been awarded in six cases to victims of torture or their bereaved families for moral harm, but the amount of compensation is neither fair nor adequate. Components of redress should also include public apologies and guarantees of non-repetition. In Kazakhstan, the lack of mechanisms for awarding compensation continues to obstruct redress. The average compensation paid in torture cases remains inadequate at from 250 to 6000 US dollars. A draft law on compensation to victims is being developed which will mention victims of torture specifically, although the amounts of compensation suggested are insufficient at about 185 US dollars. In Kyrgyzstan no victim of torture has received any compensation payments despite there being several court rulings granting compensation. A broader plenary discussion followed clarifying the role of the coalitions against torture to attempt to break the cycle of torture and impunity and keep torture high on the agendas of governments in the region and on the international agenda. The coalitions work to address the root causes of torture, promote international human rights standards and to achieve sustainable change in policy by undertaking strategic litigation and constructive dialogue with the authorities on improved torture prevention. Several speakers emphasized that states are responsible for torture and that torture should not be politicized. There were many expressions of solidarity with coalitions against torture in Central Asia and a recognition of their important work. The issue of sexual violence being classified as a crime of torture was also discussed in relation to Kazakhstan where legislation is inadequate in protecting victims of sexual violence. 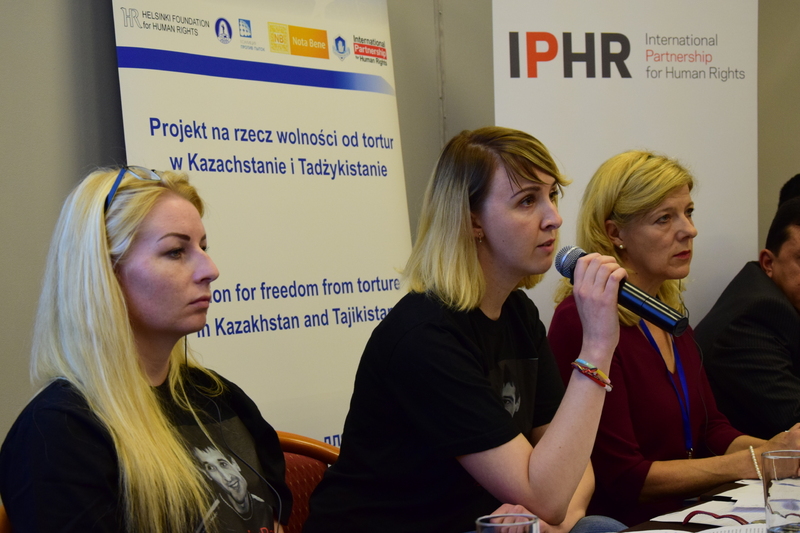 The Warsaw event was organized with financial assistance of the European Union within the project “Action for Freedom from Torture in Kazakhstan and Tajikistan“. Its contents are the sole responsibility of the NGOs organizing it and can in no way be taken to reflect the views of the European Union and the co-funding Open Society Foundations.